"Tara Sheridan is the best criminal profiler around - and the most unconventional. Trained as a forensic psychologist, Tara also specializes in Tarot card reading. But she doesn't need her divination skills to realize that the new assignment from her friend and sometime lover, Agent Harry Li, is a dangerous proposition in every way. Former Cold War operatives, all linked to a top-secret operation tracking the disposal of nuclear weapons in Russia, are disappearing. There are no bodies, and no clues to their whereabouts. Harry suspects a conspiracy to sell arms to the highest bidder. The cards - and Tara's increasingly ominous dreams - suggest something darker. Even as Tara sorts through her feelings for Harry and her fractured relationship with the mysterious order known as Delphi's Daughters, a killer is growing more ruthless by the day. And a nightmare that began decades ago in Chernobyl will reach a terrifying endgame that not even Tara could have foreseen..."
I'm going to keep this review brief, because the beauty of reading a novel is uncovering all of its secrets for yourself, one page at a time. There's nothing worse than reading spoilers before reading the book for yourself. So I'll just give you the basics, and hope that you trust my glowing recommendation. I thoroughly enjoyed reuniting with the cast of characters I met in the first book. Tara returns, and her tentative relationship with Harry (her Knight of Pentacles) is finding its legs while they work together to find a mysterious murderer whose goal is to facilitate worldwide horror and tragedy in a most unprecedented manner. Cassie and the Pythia are also back in this sequel with a storyline of their own, which eventually merges with Tara and Harry's quest. There are also a few new characters who keep things entertaining. The story centers around Chernobyl and the aftermath of the devastation that happened there. A few days after I finished reading this book, the explosions began at Japan's nuclear power plant. The synchronicity was uncanny. As in the first book, Tara uses her tarot cards (which she hides in a cigarette box in her purse) throughout the book, and we get to experience each reading. She also has several tarot related dreams, where figures from certain tarot cards come to life and guide her, giving her clues as to what the future has in store. This engaging paperback is 360 pages, with 21 chapters. I'm assuming the number of chapters is a wink and a nod to the numbered Major Arcana cards, as I believe Dark Oracle also has 21 chapters. 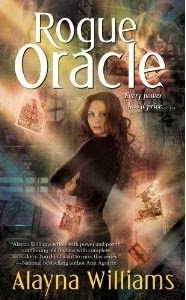 Rogue Oracle definitely deserves a place on your bookshelf. But be sure to start out with Dark Oracle , if you haven't read it yet, so you will be familiar with the characters and their back stories. The Fate of Tara's Future? I asked Alayna if there would be additional books in the series, and she says she was only contracted for the first two Oracle books. She has an outline waiting for the third book, if she gets the green light from Juno Books. I'll be crossing my fingers, because I really, really want to explore more of Tara's adventures! This book review was originally posted on my previous blog (Tarot Dame) on 4/11/11.